“God save the Queen,” an expression signifying loyalty and patriotism, is a popular phrase spoken among the corset and armor clad attendees of the Michigan Renaissance Festival. This lively event located in the city of Holly has been active for over 30 years, and does a phenomenal job at making those who attend feel like they are in the 16th century. This festival provides plenty of activities for any age, which makes it a great family event. The festival begins on Aug. 17th and continues until Sept. 29th, with each weekend providing a different theme. This year, they are introducing four new forms of medieval entertainment. One of the acts, Brothers in Arms, includes warhorses, knights and ladies in majestic gowns. The Renaissance Festival will also be introducing The Blue Mermaids, who will be performing underwater acts. Roane, an intricate three-part vocal harmony group, will also be included. Enchanted statues called “The Ruins” will also be included. Entertainment coming back this year include palm readings, washing well wenches, Sirena Sirens (singing mythical creatures that the sailors fear and adore), Shock and Awe Sideshow (an old fashioned circus), Hob the Troll (the world’s greatest singing troll), Christophe the Insultor, and plenty more! 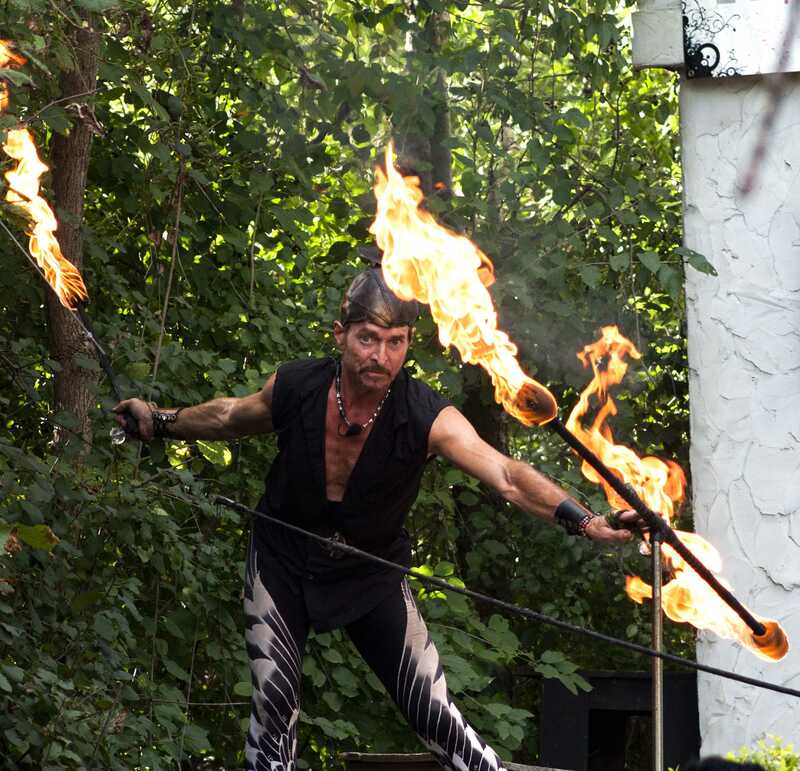 Though the Renaissance Festival may come around every year, it is still an event you will not want to miss. This is the place to go if you want to buy a giant-sized turkey leg, a sword and shield, or just a few handmade candles without looking out of place. There is plenty of shopping to do around here and many eccentric townspeople to talk to. The festival encourages attendees to dress up and join the festivities, and though it’s not required, it makes the experience all the more fun. The memories you’ll make will be enough to make anyone want to attend the Renaissance Festival this fall. There’s never a dull moment going on here, so get ready to be shouting “huzzah” amongst the villagers, knights, and royalty at the 2013 Michigan Renaissance Festival, just don’t forget to bring your flail. Ticket prices vary amongst ages and are cheaper when purchased online. At the gate it is $20.95 for adults, $18.95 for ages 65 and up, $11.95 for ages 5 through 12, and with a valid college ID it is $18.95. Online, you can purchase an adult ticket for $17.95 and tickets for ages 5 through 12 is $9.50. For more details about specific themes, weekends, season passes, etc., visit the Renaissance Festivals’ website at, www.MichRenFest.com.